ICS, Inc. serves a diverse marketplace for a wide range of clients throughout the country. We have the experience, resources, project and safety control systems in place to complete your project, regardless of its size or scope. 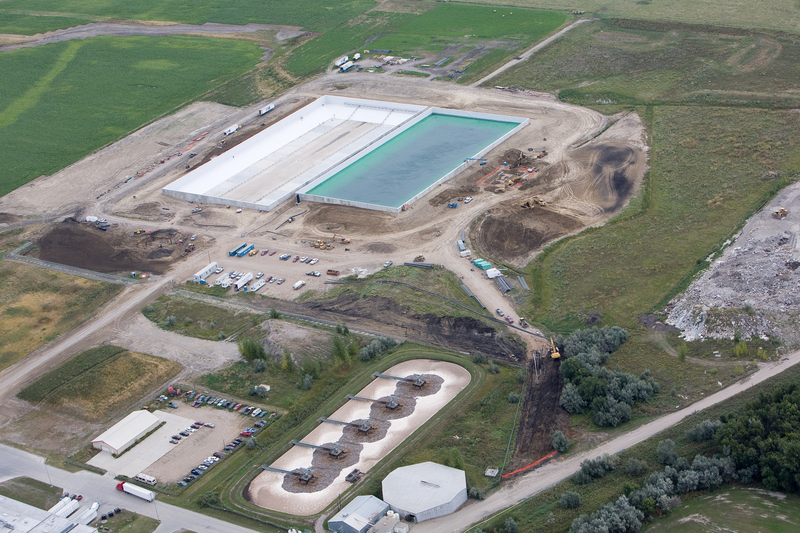 Project included construction of two 27,000,000 gallon concrete potato solids digesters along with site piping, off site piping, a lift station and 6 buildings which were completed under a design build contract. 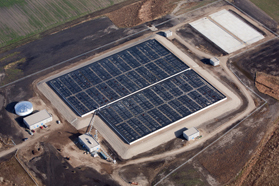 The anaerobic solids digesters reduce the amount of solid waste leaving the plant as well as produces biogas which is captured and utilized by the plant. Approximately 15,000 cubic yards of 4,000 PSI concrete; 4,000 cubic yards of 4,500 PSI concrete was poured along with approximately 2,480,000 lbs of rebar. We also installed all of the underground piping to transport the biogas from the digesters back to the boiler plant. The Raw Receiving Project consisted of the remodel of an existing 22,000 square foot potato receiving building and an addition of a new 3,160 square foot silt settling and rock roll off area. The ND Ready Mix & Concrete Products Association presented Industrial Contract Services, Inc. with a 2012 Excellence in Concrete (Commercial Category) for their work on the Simplot Potato Solids Digester. Designed and built a new 193,000 square foot manufacturing plant that includes a manufacturing area, office area and an associated car parking lot. Included all site work, precast concrete walls, concrete floors, hazardous material storage, fire sprinkler system, conference room, employee dining area, mailroom, IT space, staff support areas, loading docks, truck ramps and all infrastructure. The structural system included cast in place foundations and spread footings, hot-rolled columns and four bays of eccentrically braced frames in conjunction with precast shear walls, and steel joists and joist girders and a complete structural expansion and isolation joint that split the 880' long facility into two independent halves. Moment frames utilizing 48" joist girders and W16 x 67 columns were also used at the side of the separation joint. This allowed for a clear access between the halves without any sheer bracing panels that would obstruct the material flow of the manufacturing process. The structure was designed to readily add an addition along the north exterior wall. Concrete piers sized for future gravity and wind bracing loads were installed, the exterior precast wall panels were attached using details that allow easy removal of the wall panels for the future expansion of the plant. 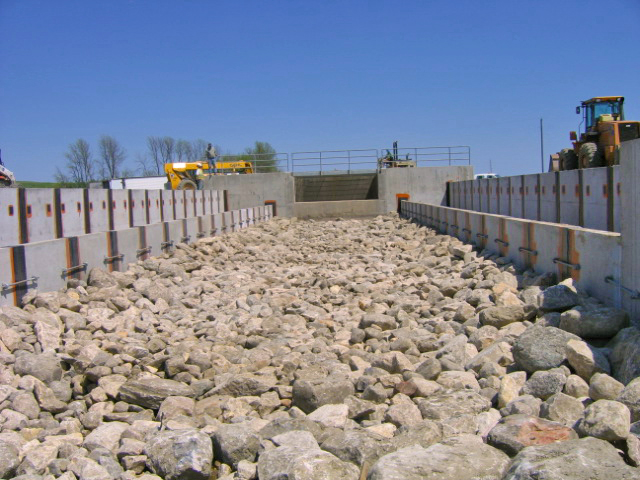 This project also included a 72" diameter boring under a railroad track to a retention pond for storm water management. 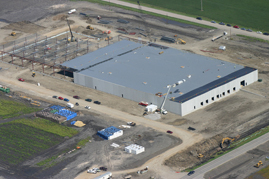 This project was constructed utilizing an Open Book - Fixed Fee method of delivery in which the owner recognized a significant portion of value engineering cost savings. The ND Ready Mix & Concrete Products Association presented Industrial Contract Services, Inc. with an Excellence in Concrete (Commercial Category) for their work on the Integrity Windows, Inc. complex. This project was the outlet structures and piping which receives water from Devils Lake at the new East End Inlet and then transferred thru a 96" pipeline into new structures. There are two structures and piping constructed, the outlet structure of 1,600 cuyd's receives the water from the pipeline its function is to dissipate the flow of water from the pipeline and provide a rock filtering system. A 72" connection pipe line was installed to transfer the water from the outlet structure to the terminal structure. The terminal structure of 480 cuyd's spreads the flow of water over the entire structure. The water then is emptied into the Tolna Coulee. The project requirements included an extremely large liquidated damages clause if the project was not completed by July 2012 as the inlet was intended on being completed at the same time. We started in December of 2011 and worked thru winter conditions to complete the project on time. The ND Ready Mix & Concrete Products Association presented Industrial Contract Services, Inc. with a 2012 Excellence in Concrete (Governmental Category) for their work on the Devils Lake East End Outlet. 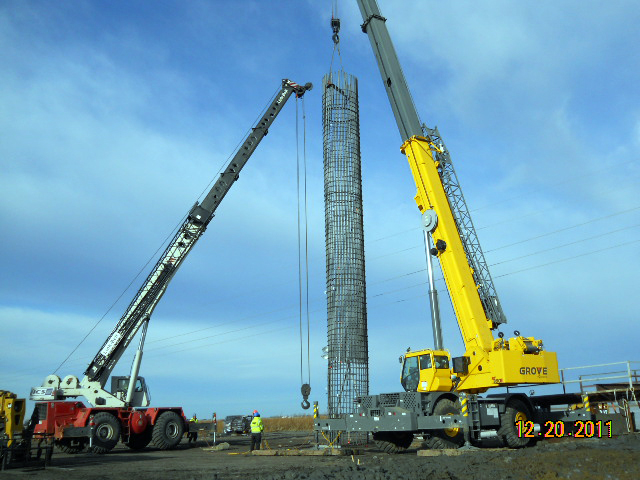 This project consisted of the construction of the Devils Lake-Carrington and Rugby-Devils Lake 115-kV Transmission Line Structure Replacements with a project start date October 13, 2011 and project completion date October 12, 2012. The project consisted of removing approximately 1.75 miles of existing transmission line, including 14 wood 115-kV H-Frame structures, 379.5 KCMIL, ACSR conductor, 3/8 high strength overhead ground wire and optical overhead ground wire (OPGW) and constructing 1.75 miles of 115-kV transmission line on nine single-pole base-plate steel structures with 477 KCMIL, ACSR conductor, and 3.3 miles of one 0.465 OPGW. This section of the Rugby-Devils Lake 115-kV transmission line to be constructed is in water. Temporary roads and work pads had to be built in order to get to the work areas to perform the job. The concrete piers that support the steel poles are 8'-0" diameter by 75'-0" long. Each pier consisted of 125 cubic yards of concrete, provide by Strata, for a total of 1,125 cubic yards. At an additional site we installed two steel collars to protect existing steel pole structures 2/4 and 2/5 on the Devils Lake-Carrington and Rugby-Devils Lake double circuit 115-kV transmission line and filling each of them with 20 cubic yards of ready mix grout, provided by Strata, for a total of 40 cubic yards. The existing structures 2/4 and 2/5 are located in Devils Lake and are only accessible by water and the work had to be performed from a barge and tugboat.